One of the best ways to learn any domain deeply is to look at the actions of the experts in that domain and clone it. Cloning is not blind copying but instead it is rediscovering the reasons behind those actions and learning from it. This way we increase our odds of becoming an expert one day. I have seen this working in (1) Investments in the form of 13Fs (2) Programming; reading the code written by engineers better than us (3) Reading books which are read by people better than us. I follow few experts when it comes to reading books. I purchased the book 100 to 1 in the stock market by Thomas W. Phelps as soon as I saw the recommendation given below. In this post I will be summarizing some of the key ideas from it. Paul Garret was an accomplished man facing retirement in 1956 at the age of 64. He determined to make his last years his best years rather than sit out the rest of his life as so many pensioners do. He wanted to increase his wealth in order to increase his power to help others. He did not have any children so he was not heir-selfish. He decided to increase his wealth by investing in fast growing companies that met his four criteria. 1. It must be small. Sheer size militates against great growth. 2. It must be relatively unknown. Popular growth stocks may keep on growing but too often one has to pay for expected growth too many years in advance. Probably to meet this criterion the stock he wanted would be traded over–the-counter rather than on any stock exchange. 3. It must have a unique product that would do an essential job better, cheaper, and/or faster than before, or provide a new service with prospects of great and long-continued sales increases. 4. It must have a strong, progressive, research-minded management. He had few friends in the Wall Street and in business. Without asking for any confidential information he asked for the names of smaller companies which they liked but were not sure of. He came up with a list of fifty stocks. Then he did his homework on these companies by studying their financial reports. He shortlisted three of them and did field trips and met their chief executive officers. Finally he chose one, Haloid, now Xerox, and invested $133,000 in its stock between 1955 and 1959. On average each stock costed him $1. In 1971 each stock was selling for around $125. His initial investment grew from $133,000 to $16,625,000. His wealth compounded at 32.85% in 17 years. Sounds easy, but Mr. Garrett first had to find the stock he wanted. Then he had to buy it in the face of recommendations against it by people who either knew nothing about, or had pets they liked better, or believed in diversification no matter what. And finally, he had to hold on, and buy more, against repeated “sell” recommendations he began to receive even before the stock had double in price. The key takeaway is: To make money in stocks you must have “the vision to see them, the courage to buy them and the patience to hold them.” Patience is the rarest of the three. Where does one look for 100-to-one stocks? Making a 100 bagger in the stock market is a black swan event. For that happen we need to get exposed to them. Phelps suggests the following places to get an exposure to them. Inventions that enable us to do things we have always wanted to do but could never do before. Some examples are automobiles, airplane and television. New methods or new equipment for doing things we long have had to do but doing them easier, faster, or at less cost than before. Some examples are computers and earth-moving machinery. Processes or equipment to improve or maintain the quality of a service while reducing or eliminating the labor required to provide it. Some examples are disposable syringes and frozen foods. New and cheaper sources of energy such as kerosene replacing whale oil, fuel oil replacing oil, and electricity generated by atomic power replacing them all. New methods of doing essential jobs with less or no ecological damage. An example is the use of sterilized insects to wipe out a pest rather than employing chemicals harmful to many desirable forms of life. Improved methods or equipment for recycling the materials used by civilized man instead of making mountains of waste and oceans of sewage. New methods for delivering the morning newspaper without carriers or waste, yet having it instantly available for review at later date. Think of Internet. New methods or equipment for transporting people and goods on land without wheels. There are four categories of stocks that can produce 100-to-one returns. They are (1) Advance primarily due to recovery from extremely depressed prices at bottom of greatest bear market in American history. Special panic or distress situations at other times belong in this group too. (2) Advance primarily due to change in supply-demand ratio for a basic commodity, reflected in a sharply higher commodity price. (3) Advance primarily due to great leverage in capital structure in long periods of expanding business and inflation. (4) Advance primarily due to the arithmetical result of reinvesting earnings at substantially higher than average rates of return on invested capital. My favorite is the fourth category and this is what Buffett and Munger does. This book was written in 1972 and the author explains about the durable competitive advantages of a business by using the word gate. Buffett fans should read it as moat. Remember in 1972 Buffett was still practicing Graham style of cigarbutt investing and this guy has already figured out the holy grail of investing. My fourth category of stocks showing one hundredfold appreciation is that of companies reporting a far above-average rate of return on invested capital for many consecutive years. In such issues the investor has simple arithmetic and Father Times on his side. Even in this category, however, there is no free lunch, no “sure thing”. First there is the danger that the high rate of return on invested capital may attract too many competitors. No business is so good that it cannot be spoiled if too many get into it. It is vitally important that the high rate of return be protected by a “gate” making entry into the business difficult of not impossible. Such gates may be patents, incessant innovation based on superior research and invention, ownership of uniquely advantageous sources of raw material, exceptionally well-established brand names – you can fill in others as you choose. Just be sure the “gate” is strong and high. Most of us want pretty much the same material things in life – good food, good clothes, a home on the right side of the railroad tracks, good schools for our children. To get more than the average we must be able to do more than the average, or do what we do better than the average. If all we can do is take in washing there will always be someone down the street ready to take it for two cents a pound less than our price. Thousands of investors have owned one or another of these 100-to-one “high-gate” stocks at sometime or other in the last forty years. Probably not one in a thousand has held his winner until it increased one hundredfold in value. All of course wish they had done so. Yet it would be just as great a mistake to assume that what has been will continue to be forever and ever. Or to pay now for all the growth that can be foreseen. The total number of years and the rate of return required to increase the stock price to increase by 100 times is given below. 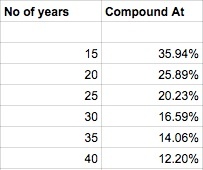 Albert Einstein is absolutely right when he said that compounding is the eighth wonder of the world. Investing is not a game against nature, but against other investors. Both buyers and sellers are acting on the same information but doing opposite things. Who is right? The recent earnings and dividends reported is history and the seller already enjoyed the benefits. As a buyer you are buying an unknown future. Investing is a game of probabilities and possibilities but not certainties. A rational investor should understand this. If not he is a damn fool. Stock market is like the game of poker. A wise investor bets big only when the odds are stacked heavily in their favor. If not they don’t do anything. Buffet’s purchase of Coke falls into the first category and his purchase of American Express falls into the second category. But how can we measure what millions of other investors are expecting? Phelps gives a logical solution for this with three simple rules (1) The value of any security is the discounted present worth of all future payments (2) A dollar of income from one fully taxable source is worth as much as dollar of income from any other fully taxable source (3) Hence it follows that when investors pay more for a dollar of income from one source more than they need to pay to get an equivalent dollar of income from another source they are expressing implicitly the opinion that the income stream from the first source will rise faster or dry up more slowly than the income stream from the second source. Otherwise what they do makes no sense. Stock price has two components to it. One of them is the actual earnings per share and the other one is the multiple people are willing to pay for $1 of earnings. Multiple is commonly referred as p/e ratio. Imagine you bought a stock for $10 which is earning $1 and has a multiple of $10. The business is doing really well and the expectations of the market is exuberant and they bid up the multiple to 40. For this stock to become a 100 bagger your earnings needs to increase by 25 times. The math is given below. On the other hand if you bought the stock for $100 which is earning $1 and has a multiple of 100. If the multiple stays constant (which is very rare) then the earnings should grow by 100 times for you to make a 100 bagger. The math is given below. The moral of the story is simple. If you pay too much for the stock then for the price to go up all the heavy lifting should be done by growing the earnings. Multiple reflects market psychology and it oscillates between extreme fear and greed. One has to be extremely careful to not pay too much for the stock. But this simple fact is often forgotten. Peter Lynch explained this concept beautifully which I have given below. If you remember nothing else about p/e ratios, remember to avoid stocks with excessively high ones. You’ll save yourself a lot of grief and a lot of money if you do. With few exceptions, an extremely high p/e ratio is a handicap to a stock, in the same way that extra weight in the saddle is a handicap to a racehorse. A company with a high p/e must have incredible earnings growth to justify the high price that’s been put on the stock. In 1972, McDonald’s was the same great company it had always been, but the stock was bid up to $75 a share, which gave it a p/e of 50. There was no way that McDonald’s could live up to those expectations, and the stock price fell from $75 to $25, sending the p/e back to a more realistic 13. There wasn’t anything wrong with McDonald’s. It was simply overpriced at $75 in 1972. And if McDonald’s was overpriced, look at what happened to Ross Perot’s company, Electronic Data Systems (EDS), a hot stock in the late 1960s. I couldn’t believe it when I saw a brokerage report on the company. This company had a p/e of 500! It would take five centuries to make back your investment in EDS if the earnings stayed constant. Not only that, but the analyst who wrote the report was suggesting that the p/e was conservative, because EDS ought to have a p/e of 1,000. If you had invested in a company with a p/e of 1,000 when King Arthur roamed England, and the earnings stayed constant, you’d just be breaking even today. Given below is the income statement of John and Peter. Both are of same age and their income and earnings are also the same. If I ask you to assign an earnings multiple for them how much would you assign? You cannot assign the same multiple to both of them. Why? I have not given you the complete information. Now take a look at the complete information. 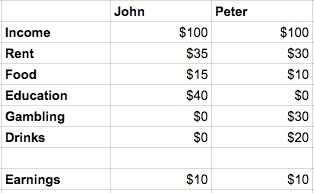 It should be very clear that John’s earnings should receive higher multiple than Peter. Why? John spends a lot of money in educating himself. Also he pays higher rent which suggests that he is living in a better community and he is spending more on eating healthy foods. But Peter spends half his income on gambling and drinks and none on education. Given these facts it should be obvious that John is likely to earn more in future and it will result in his earnings growing at a faster rate. What is the takeaway lesson? Companies are like people and their earnings vary so much in quality. Hence comparing them blindly is like comparing cows and horses on the basis of how fast they can run. Phelps talks about two kinds of earnings accounting and conceptual. Buffett fans should immediately recognize this as nothing but owners earnings. Here are few things every investor should consider when looking at earnings (1) Does the company manipulate earnings by cutting down its spending on R & D (2) Does the company sells a lot of items using credit which increases accounts receivable and earnings (3) Do they build up inventory by running its plants more than its allowed capacity which results in reducing unit of cost of production and increases earnings (4) Do they squeeze their employees to increase earnings (5) Do they pollute their environment by cutting corners. If you answer yes to any of these questions then the quality of earnings is strained. The reason is because all these items might boost earnings in the short term but they are awful in the long term. Remember we are in the long term game for 40 years. Never do business with a man you do not trust. If the management is not trustworthy then avoid it like a plague. Phelps explains why using an analogy from biology. When morally derelict men get to the top of great corporations and stay there for a period of years, the evil they do does indeed live after them. Inevitably they bring into the organization and promote to higher levels men like themselves. The moral cancer thus introduced cannot be extirpated simply by removing the evil genius at the top. It may take a generation under a good management to purge the organization of the unprincipled sharp-shooters brought in by a bad management. Hence it is unwise to look for a quick turnaround in any organization whose management has demonstrated a lack of moral principle. Stocks go up and down for many reasons. Even their earnings may go up or down for many reasons. As an investor what we should think about is earning power. What is the difference between earnings and earning power? One of the best explanation given by Phelps. Earnings are simply reported profits no matter how obtained. As we have already seem, earnings may rise because of a sudden, non-recurring surge in demand, because of a price advance, because of a change in accounting practices, because of improvement in business generally which permits utilization of what previously was excess productive capacity. None of those reasons reflects earning power any more than the movement of a cork downstream attests its motive power. Earning power is competitive strength. It is reflected in above averages rates of return on invested capital, above average profit margins of sales, above average rates of sales growth. It shows to best advantage in new or expanding markets. Failure to distinguish between ephemeral earnings fluctuations and basic changes in earning power accounts for much over trading, many lost opportunities to make 100 for one in the stock market. To check if the firm has earning power every investor should see 10 year trends for (1) Sales growth (2) Profit margins (3) Return on equity (4) Return on invested capital (5) Ratio of sales to invested capital (6) Buildup of book value. We should make sure that they are not showing signs of weakness. Read the paragraph given below several times. To me this is the secret of hundredfold returns. Real growth is as simple and certain as arithmetic if the book value of a stock is increased by retained earnings while the rate of return on invested capital remains constant. To illustrate, let us assume our company has a book value of $10 a share, with no senior securities, and is earning 15 percent on its invested capital. In this example, book value and invested capital per share are the same. Let us assume further that our company pays no dividends. At the end of the first year per share book value will be $10 plus 15 percent of $10, or $ 11.50. At the end of the fifth year book value will be $20, and at the end of the tenth year $40. If our company can continue to earn at the same rate on this invested capital, its earnings in ten years will be four times the starting figure. If our company pays out a third of its earnings in dividends, the amount plowed back each year will be 10 percent per share book value. At that rate it will take nearly fifteen years, instead of ten, for book value and earnings to quadruple. Earning at 15 percent and paying no dividends, our stock would grow one hundredfold in thirty-three years. Earning 15 percent and paying a third of earnings in dividends, out stock would take more than forty-eight years to multiply its assets and earnings by 100. Chipotle Mexican Grill is a chain of restaurants, specializing in burritos and tacos. I have been eating burritos there since 2006 and the restaurant is always crowded. I never bothered to read their annual report once and now I am sucking my thumb after looking at its earning power which is given below. Its return on invested capital is very solid and improved over the years. Book, Revenue, and Earnings all trending up. Look at the P/E in 2006. It was 45 and an uncritical mind would have rejected the stock stating that it is expensive. A critical investor would have asked (1) How many new stores can they open before saturating in the US (2) Are they expanding internationally (3) Are the stores crowded (4) Do they have a moat. By doing that he would have seen the enormous growth potential in the stock. From 2006 to 2013 earnings increased by 30.06% and P/E stayed almost flat thus earnings growth contributing to stock price increase from $57 to $530.75. This represents a compounded growth of 32.17%. Buying right will do little good unless you hold on. But holding on will do you little good – and may do you great harm – unless you have bought right. 100 to 1 in the stock market is one of the best investing books I have read. The book ends with the following statement. In Alice in Wonderland one had to run fast in order to stand still. In the stock market, the evidence suggests, one who buys right must stand still in order to run fast. Thanks Dileep. Unfortunately I do not have a pdf. You can buy it from Amazon dot com. A used copy in “Good” condition will cost you at least 4.7k. I paid an additional 2.4k for express delivery. Standard delivery/shipping cost would be only 0.65k but may take up to 45 days for delivery. After reading the excerpts presented here, I felt, I should read the book, asap. Seriously, was the book written in 1972!!! One of the best books I have ever read. If I was not a Buffett fan then I would rate this on par with his shareholders letters. Keep sharing. All the best. Price is what you pay and value is what you get. This book is worth the price and it is a value buy with a big margin of safety. Thanks for the response. Will it be possible to try a formula with the following conditions? Saying ROE for 10 years > 20 AND Sales Growth > 10 AND ROIC for 10 years > 20… and I hope we need to have the another aspect that company is having huge growth potentials from current levels (Do we need to add a market cap filtering as well). This may help to get 100 companies from indian equity and study in depth to reach 3 convincing ideas if possible. Your current filter seems to be a good starting point. Also add the debt/equity ratio is very low. Learnt a lot from this post. Thank you so much Jana. Doesn’t that Chipotle example right away contradict what you tried to say before, Chipotle investor is lucky in its PE staying high because if it contracted to typical restaurant stock it would have crushed the investor. Poor choice of an example IMHO. Thanks a lot for your comments. The point I was trying to make is that the earning power behind Chipotle business is really strong and what drove the stock price was its tremendous growth. Also let us assume that the PE got cut into half which comes to 22.5 (45 / 2). But with 2013 EPS of 10.47 the stock price will trade at $235.57. This gives a compounded return of around 23% in 8 years. Great Buffet like thoughts. Most of us retail investors don’t have the time to do the proper research. Maybe when we become pensioners we can follow these fantastic rules of investing. It still is remarkable how professional managers including genius hedge fund guys usually have problems beating the averages. Excellent blog! My own experience bears out the ideas and concepts of the book. A query: Colgate Palmolive meets all the basic requirements – earning power, management quality, consistently high ROE/ROCE, etc. Do you think these would trump 2 apparent negatives: High PE and low retained earnings due to very high dividend distribution ? Does the latter show Co. ‘ s inability to deploy fresh capital profitably ? Thanks. I have not looked Colgate’s annual reports. The latter is because its current business does not need any additional capital. Also the management does does not want to diversify into new businesses. Thanks for the prompt reply. Re Zemmuthu’s filters, apart from debt/equity, he has also left out the most imp. earning power variable, namely cash flow. Jana, as there are problems with computing free cash flow because of maintenance capex vs. discretionary capex distinction, should one stick to easily available fig. of operating cash flow? By the way, Zenmurthy has also left out the key filter of the margin of safety like P/E ratio etc..
You are right about free cash flow which eliminates capital expenditure. For a growth company like Amazon it will be zero or negative. But every $1 retrained and invested back in the business adds value. This is not accounted for in free cash flow. As Buffett does we can only subtract maintenance capital expenditure and get the owner’s earnings. But most companies do not reveal them. This leads to assume it is equal to depreciation. But that might be incorrect too as the company can accelerate it. Penman handles explains all these concepts beautifully and adjusts accounting to measure the value (residual earnings) added by the business. I would highly recommend this book. Superbly written article. Wonderful insights. Thanks Jana for the detailed response. Will check out the book suggested by you. Is there a web based source for getting the ranking of, say, top 500, listed Indian companies, as per the Joel Greenblatt magic formula? Do you have this info.? Wonderful Article. Lots of learning! A regular follower of your blog, Jana. Observed you read a lot, can you please suggest your top 10 must read books. And top 10 for being Better Investor.. Check out this post for books to read across multiple disciplines. Jana, Thank you for generously sharing your learning from the book. Great article, i reuest you to post some article abt complex financial derivatives products. Keep up the work Jana!! Every post of your’s is a sincere way to educate all readers.. I am a slow reader and I spend a week to finish a book. While reading, I take notes on the book and reread it before blogging so that all the key arguments from the book is captured. If the book is very good then I purchase its audio version and also listen to it also. This way the concepts gets engraved in my brain. This process is time consuming but really worth it. and for all the people who want to have ebook 100 to 1 in stock market, you can loan it through http://www.openlibrary.org for 14 days for free. Excellent post and blog .I have visited your blog first time and feeling that its too late i discover your blog.worth reading and come again and again .Thank you very much . I like the way you combine ideas and concepts from different books to put forth a consolidated idea. Something like the syntopical reading suggested in How to read. It is always engaging to read your blog. Based on your Chipotle example, I have one small question. While it enforced the point that the book was trying to make it also highlights the dilemma an investor faces which is what I am interested about. To remove the hindsight bias let us assume we are in 2006 and looking at chipotle’s data. We know that the ROIC is 10.62. When we ask questions, we would be asking questions like how big is the market and can they expand to every location and what would the competition look like etc and we may get some answers to that. But, it will not give us answers on how quickly would they get there. The only reasonable quantitative analysis based growth that one could project is to see the reinvestment rate. Let us for a moment assume that the ROE of Chipotle was same as ROIC (debt to equity is not known) and they reinvest the entire earning. In this case, the best case growth one could think of is a earnings growing at 10.62%. How could the investor ever forecast that the ROIC would increase from 10.62 in 2006 to 23.52 in 2013 ? Unless they could have forecasted it, they could have only expected to earn around 10.62% if the PE remained constant. This is where i am not sure how much of it is skill and how much luck (I am sure you would have read the article of Michael Mauboussin regards to skill and luck). Is there anyway one can extrapolate how ROIC or ROE of a business would increase? Dupont analysis would suggest that either the Asset turnover should increase or the margins should increase. Can we extrapolate that? Understanding moat is about sustainability of margins and ROEs but the big multibaggers are generally made when you bought a company at cheap price and then the business ROE just expands while growing which gives the double bang for the buck. I would rate it more in the luck territory. What are your thoughts? Thanks for the comments. Also your question is fantastic. If I summarize your question into two words then it will be Emerging Moats. So far I have identified moats only in hindsight and I have never identified an emerging moat. I am not qualified to answer your question. See if you can find an answer from Anil (contrarianvalueedge.com) who is passionate in the concept of emerging moats. EXCELLENTwriteup Jana ji. Thanq for sharing . With Regards . Thanks for your wonderful summary. I waited all along to complete reading the book once before I go through this. I still learnt more. Keep up your wonderful service. Thanks. some silly questions to Jana …..
a. is ROIC and ROCE are one and the same? b. how to calculate owners earnings using screener.in formulas? a. does anybody in INDIA can rent/sell their used book? b. do we have any websites in INDIA that can rent these precious books (i.e. 100 to 1, etc.) published in USA or other countries? (1) Take a look at http://goo.gl/vsfmhx for the difference between ROIC and ROCE. (2) I don’t know how to do that using screener.in. I would suggest working it out by hand from the AR.